I recently interviewed Steve Demeter, creator of the successful iPhone game, Trism, for an article that can be found on The Advocate's website. After grilling him (not really) about that title for nearly an hour, I geeked out and asked about his involvement with the fan translation of Nintendo's cult classic GameBoy Advance game, Mother 3. Apparently, Tomato (aka Clyde Mandelin, the man responsible for getting the project off the ground) approached Demeter early on in the process and asked him to play a key role in the game's translation. "He knew I had been involved with [the unofficial release of] Earthbound Zero back in the day and said he'd love it if I could put my stamp on this game as well," Demeter remembers. Unfortunately, the timing wasn't right and Demeter couldn't assist with the translation. He also couldn't help edit the translated script, the second option offered by Mandelin. 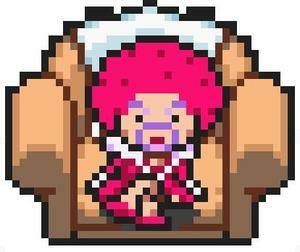 Despite the fact that he was knee-deep in the development of Trism, however, Demeter couldn't turn down Mandelin's third option: translating the text related to Mother 3's fabulously flamboyant Magypsies. Mandelin's only demand, according to Demeter: "He wanted me to sass it up. And that's just what I did. I basically thought of some of the queens I've met in the Castro as I worked on each character. I could hear their voices in my head. I took hold of those personas and put them into the game." This is pretty fantastic. They're some of my favorite characters in all of gaming. Thanks, Viewtiful_Justin! I love the characters, too. BTW, I also recently interviewed Clyde/Tomato about his decision to retain the Magypsies', er, fabulousness and will post that interview as soon as possible. Should gay gamers boycott Shadow Complex?